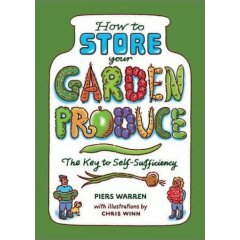 I just finished another great book, How to Store Your Garden Produce by Piers Warren. This book shows you how you can eat home grown goodness all year round by preserving your garden produce. In the opening paragraphs it points out that an acre of land can provide food for a family of four for the entire year. BUT much of that produce will become ripe and available for eating at pretty much the same time (during summer), so this is where food storage comes in. If we dont find a way to store our produce for consumption at other times during the year then we find ourselves needing to make unnecessary trips to the grocery store. Food storage helps us avoid waste and develop self sufficiency. The second half of the book is more of a reference section and discusses which preservation methods are applicable and preferred for the majority of fruits and veggies that we grow. I devoured this book in short time and the illustrations by Chris Winn had me rolling on the floor laughing. I found it to be a great resource for those who want to preserve their own garden produce. The only part of the book that I felt needed more exploration was the section on clamping. It had so-so directions and no pictures and for anyone who wants to keep potatoes you must know this method of storage so a little better explanation was needed. But dont let that stop you from reading this book. I would just suggest reading up on clamping in John Seymours book A Self Sufficient Life and How to Live It. No gardener should be without that book anyway. I especially appreciate How to Store Your Garden Produce because it shows you how you can eat local all year round. If you grow your own food and make it last all year round then there is no need to go to the supermarket and buy produce that is no doubt flown in from various other parts of the world. You dont even have to grow it yourself really. If you buy local produce at harvest time you are still able to store it for future consumption and eat local all year long.